News > Underground News > Blaze and Lex The Hex EPs available on The Casket Factory tour! Blaze and Lex The Hex EPs available on The Casket Factory tour! 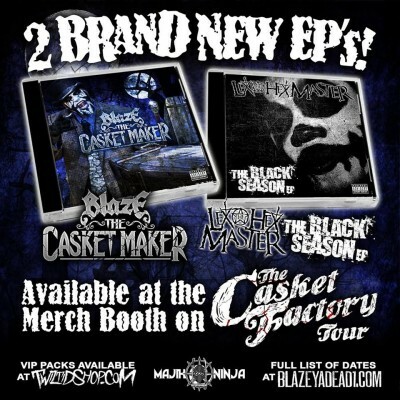 Blaze just announced to all of his Facebook followers that The Casket Maker EP, as well as Lex The Hex Master‘s The Black Season EP will both be avialable on The Casket Factory Tour! We aren’t sure of the track list yet, or how much they will be, but you WILL be able to find them on the tour! Also, Monoxide was just on Periscope and announced that both EPs WOULD be available via Twiztid-Shop.com, and that they would be cheaper there than on the tour. Don’t shoot the messenger if that doesn’t turn out to be true though! We’ll let you know when we see them pop up over there!